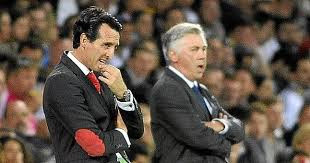 Unai Emery has countered Carlo Ancelotti's claim that Napoli can capitalise on his side's weakness on the fitness front when they meet next Thursday. The Gunners recorded a 2-0 win over the Serie A outfit to widen their chances of going through to the next stage. It was an encounter that got decided by mainly first-half performance as the Parthenopeans got punished by strikes from Aaron Ramsey and Lucas Torreira. In the second half, Napoli were better than they were in the opening period - this was obviously because some Arsenal stars suffered cramps which the former Chelsea manager thinks could have a negative effect on their opponents in the second leg. He said: ‘I think that the second half was completely different. The fact we push a lot at the end and we were physically a lot better as some of their players had cramps. Emery has however replied him at his post-match press conference by taking a swipe at him and his team. The Spanish manager said that he would prefer seeing his players have cramps and end up with a nice result than the reverse. He said: ‘I think we’re OK. The players finished tired because they worked a lot. But I prefer to finish like that and not finish matches with the possibility to continue playing. ‘I know, and the players also, that we need every player to be ready to play and help. On Monday, I am sure we are going to play different players but [try] to find the same performance. ‘Some players after playing with this demanding performance physically, maybe we need something different. Next week it will be the same in Naples. ‘We’re going to prepare for Monday first, and also recover the players after the game today thinking that we are going to play a lot of matches [every] three days. ‘We need every player with the commitment, with the behaviour and the performances. The race for a top-four slot continues for Arsenal when they visit Vicarage Road to battle with Watford on Monday night.